Along with the trip to Old Goa, we went to a Spice Farm. This one was the Sahakari Spice Farm. Since this wasn’t something I had expected to go on, I had no idea what to expect. It sounded interesting, so I figured why not! It turned out to be one of the most fascinating tours I have ever been on. When you arrive, you are greeted with a namaste and a red bindi. While you wait for the tour to start, you are given a hot tea made from lemon grass and some snacks. I think we were waiting for more people to arrive to go on our tour. Eventually, a small family of three showed up, and we started the tour. I expected to walk through the jungle to a farm, but instead the guide stopped in the middle of the jungle to start talking. He explained later that this part of the farm is wild, and the rest of the farm is laid out by type of spice and in an organized fashion. While I was disappointed we weren’t going to see the actual production of the spices, it was really interesting to see the spices growing in their natural state. 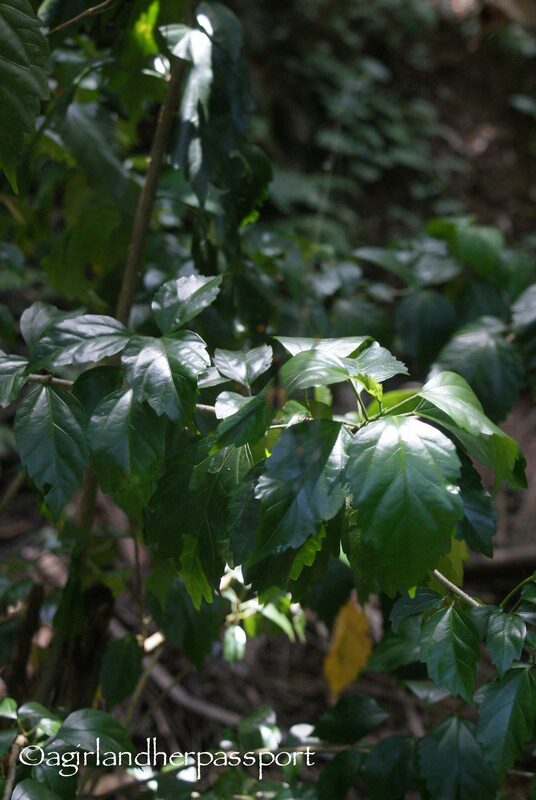 Our guide was great at having us guess what the spice was by smelling the leaves or giving us hints. He also told us all about how the spice was harvested and which spices were the most expensive. 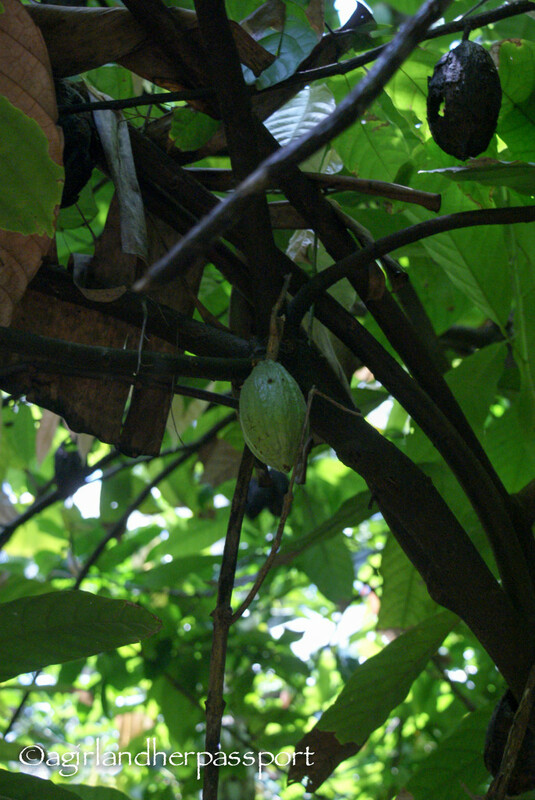 In the above photo is nutmeg. Nutmeg not only makes nutmeg but also mace! Mace as in the thing you spray at people in self-defense! Not only did I not know nutmeg made mace, I had no idea it looked like this. Such a beautiful plant! The guide continued down a dirt path and would point out plants along the way. Here you see chocolate! I was very hungry at this point and was really tempted to rip the chocolate off the tree and eat it, but I knew it is still bitter at this stage and probably wouldn’t be too pleasant. We even saw some things that were not spices, like these bananas. I had no idea that bananas looked like this on the tree. 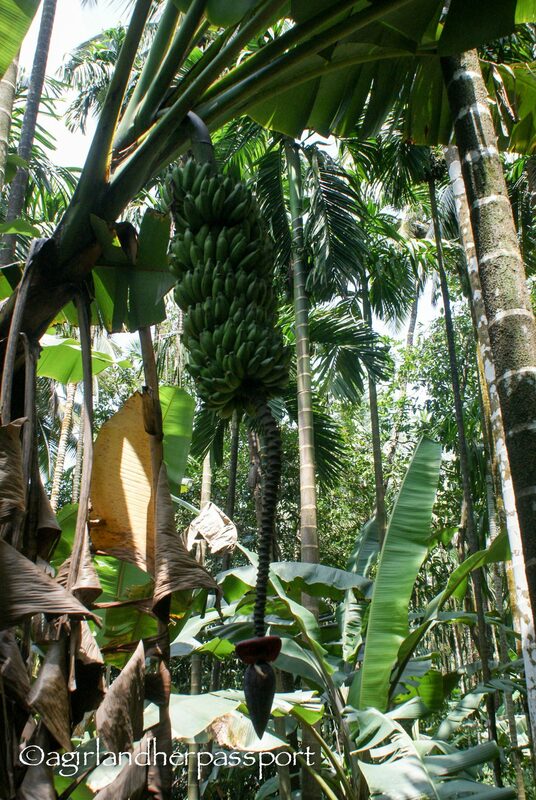 I wish there had been ones that were ripe so that we could have tried a banana fresh off the tree! As you can see it was not very farm like and I felt like I was in a jungle. Not that I minded. Just walking through it was really terrific and there was so much to see. It was also cooler as a result of all the lush greenery surrounding us. Below is a small pepper, which is growing up instead of down. I didn’t get pictures of all the spice plants, but they included cinnamon, vanilla, pepper, cardamom, allspice, and turmeric. Very few of these did I recognize by sight, but a few of them I did manage to recognize by smell. 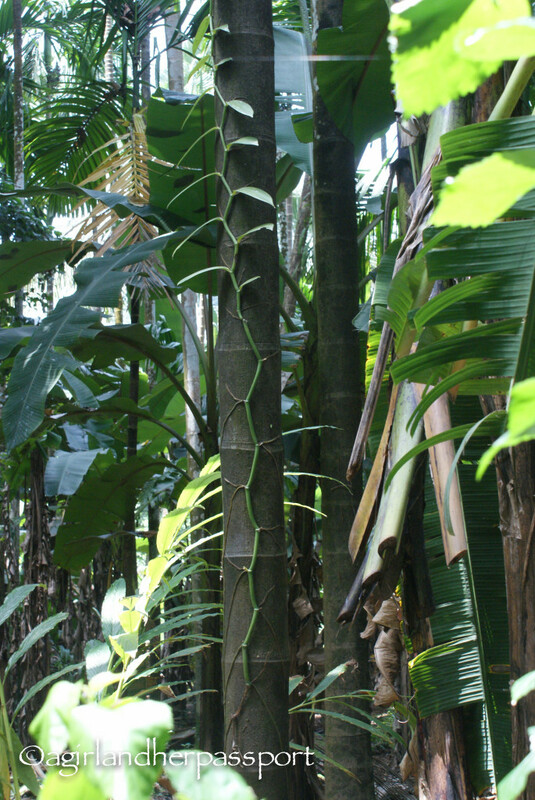 Below is a vanilla bean vine that is growing up the side of a tree for support. Did you know that vanilla is an orchid? So the vanilla vine is not harming the tree and is only using it for support. There were also creatures to see on this tour. We saw bees, spiders, and even an elephant! 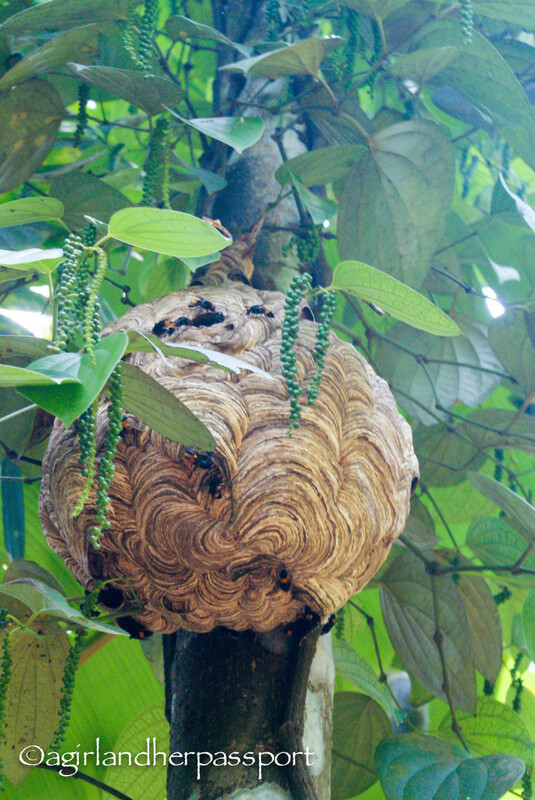 I have never seen a beehive like this. 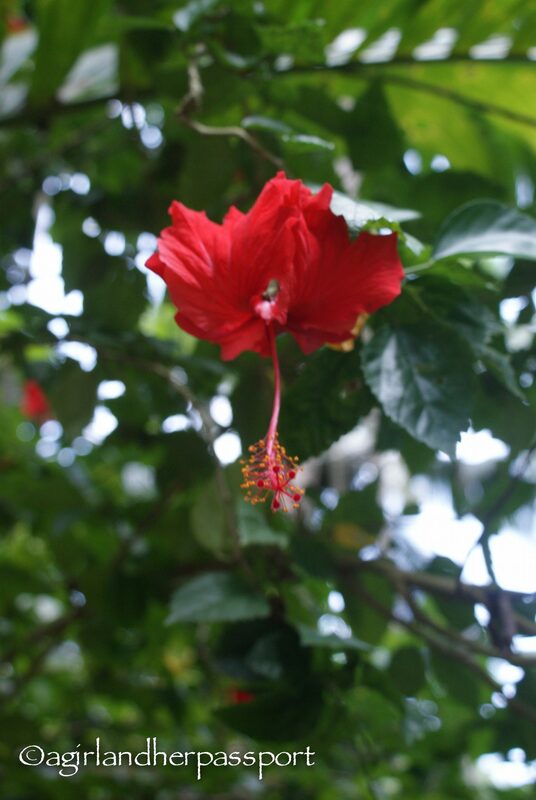 The guide explained that they are not pollinating bees, so the plants have to be hand pollinated. I guess the bees just enjoy being there. The hive reminded me of the beehives you see drawn in Winnie the Pooh books. We also saw this lovely lady. 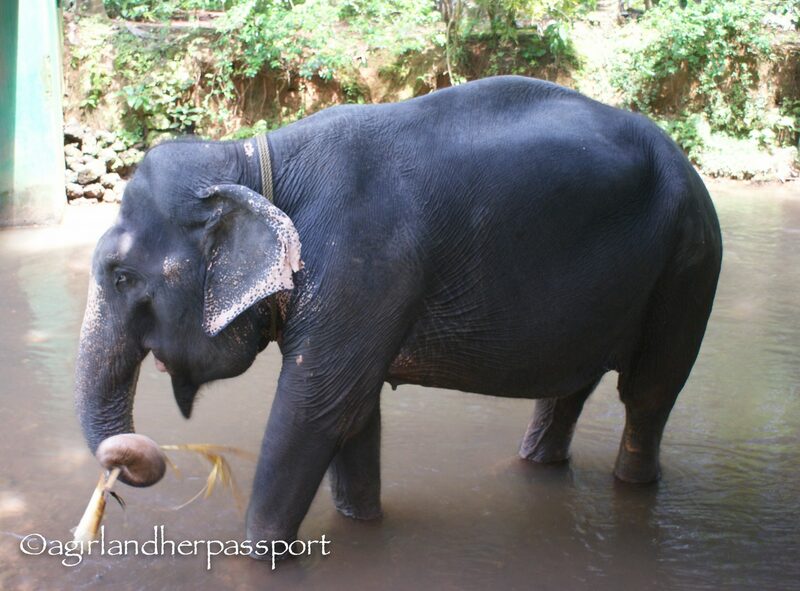 We did not ride her, as I think it isn’t right to ride elephants. I asked what she was used for and the guide said for giving people baths. You can sit on her and get a bath from her trunk. I hope she is well treated here, but I couldn’t tell. One person had gotten a bath on her while we were there. According to the farm’s website, there are two more elephants there. While I don’t like that she is being kept there, it was the only time I saw an elephant in India, so I was glad I got to see her. If you are visiting Goa, I highly recommend visiting a spice farm. It was very educational and beautiful. 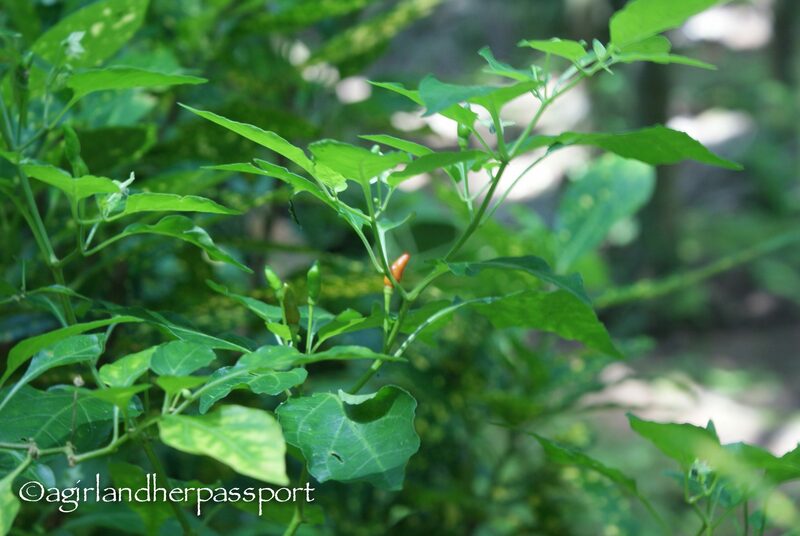 To reach the Sahakari Spice Farm, you should arrange for a taxi to take you and to wait for you. After the tour, you are served lunch, so this takes about two hours. We went earlier in the day, around 11 AM and when we left it was getting crowded. Have you been on a unique tour that you weren’t expecting? Stay safe and enjoy exploring Goa. Is the banana heart the part that hangs down? I now am going to look at your post. Thanks! Lovely post, Tiffany. India is one of my favorite destinations. I visited spice farms in Ceylon/Sri Lanka. Also found it fascinating. Did you see cashews? They were a revelation for me. And everyone had pepper vines growing up the pillars on their back porches. Fresh peppercorns off the vine is exquisite in the kitchen, a whole different flavor experience. Thanks Angela! Tons of cashews. It was amazing. 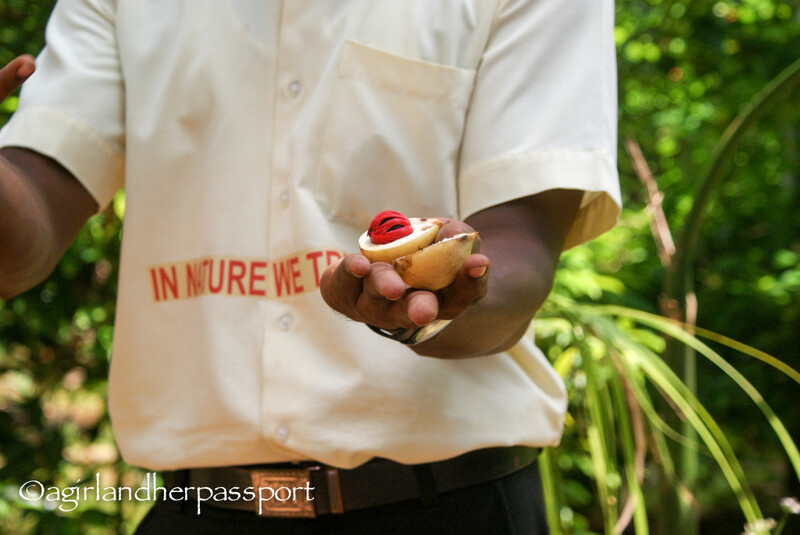 Thank you very much for the details on visiting a spice farm while in Goa. Such a great destination, that I must plan for very soon.